When I was little, my mom used to have a dress-up box for us to play with. It had some old formal gowns that she had worn in college, and some costume jewelry. My favorite piece of jewelry was this glamorous beaded ring. It had jet black beads and a band of stretchy gold. I am pretty sure I never let my sister wear it. I loved it so much. I was probably in high school before I realized that the ring had been crocheted. I haven't thought about it in years, but the other day I had a dream about it. I woke up wondering if I could find a pattern for a 60s-70s crochet beaded ring. Google Image Search to the rescue! I found exactly what I was looking for here. After I made a handful of rings (aha! no pun intended) I was talking to my dad about them, asking him if he remembered mom's glamorous beaded ring. He did remember her beaded ring, but he remembered another one she had that was red, white and blue. Apparently she had worn it out to dinner one night, back when they were still dating. He noticed it, and asked if he could look at it. She handed the ring over to him to inspect. He looked at it and frowned slightly, and then took another ring out of his pocket and said that she should wear that one instead. It was an engagement ring. I knew that my parents had gotten engaged at a restaurant, but I had no idea that a crochet ring was involved! Now I'm extra excited about my rings! I got really excited about the rings, so I experimented with some other beads to see what other looks I could achieve. The glass chip rings turned out awesome! They were also sooooo big! I ended up leaving rows 5-6 off and only using 15 beads for these rings. They are very bold. My inner 5 year-old adores them. I will say that the big, 70s style cocktail ring is quite a statement piece. I am not entirely sure how many glamorous events that I will be wearing mine to, although I am thinking that they will be playing a large part in any princess-themed birthday parties I throw, as well as any upcoming bachelorette parties. Well worth keeping in my crochet arsenal. 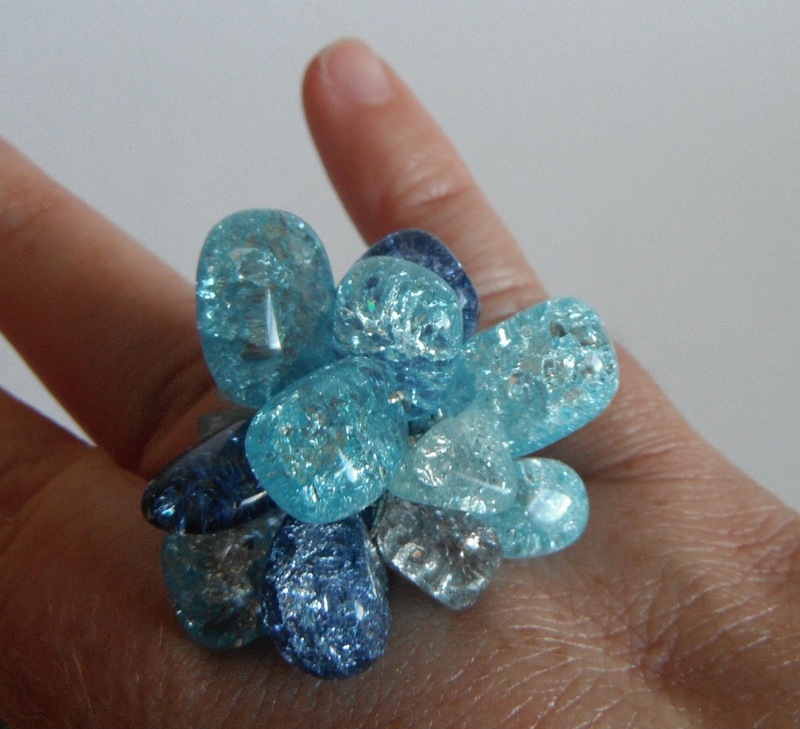 I do like chunky rings, though, so I've updated the idea. I wanted something a little smaller, and more of a fun, everyday piece. It's still chunky, but totally wearable (in fact, I wore one today! ), and dead simple to make. The hardest part (by far) is getting the beads on the elastic. After that, it's a piece of cake. 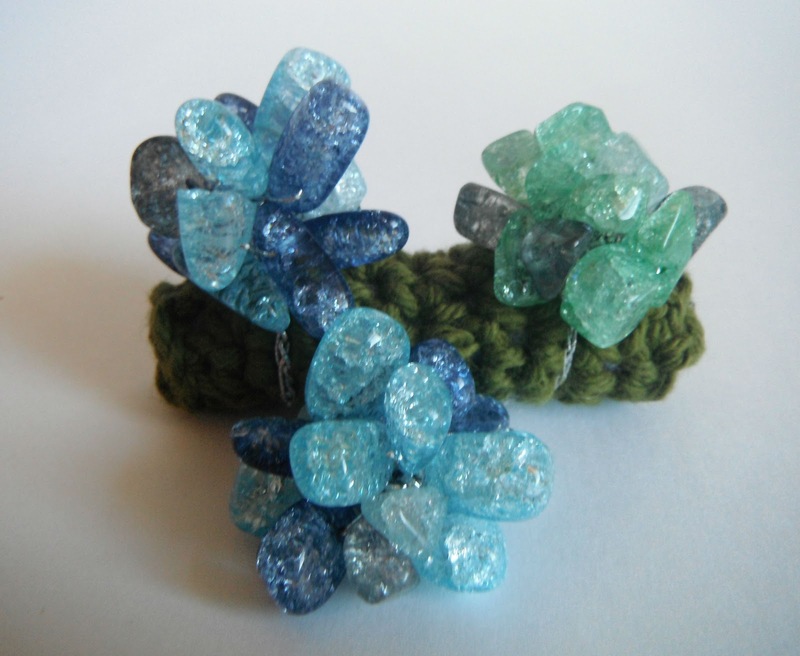 Again, I used the glass beads, which make me think of sea-glass (ooh! 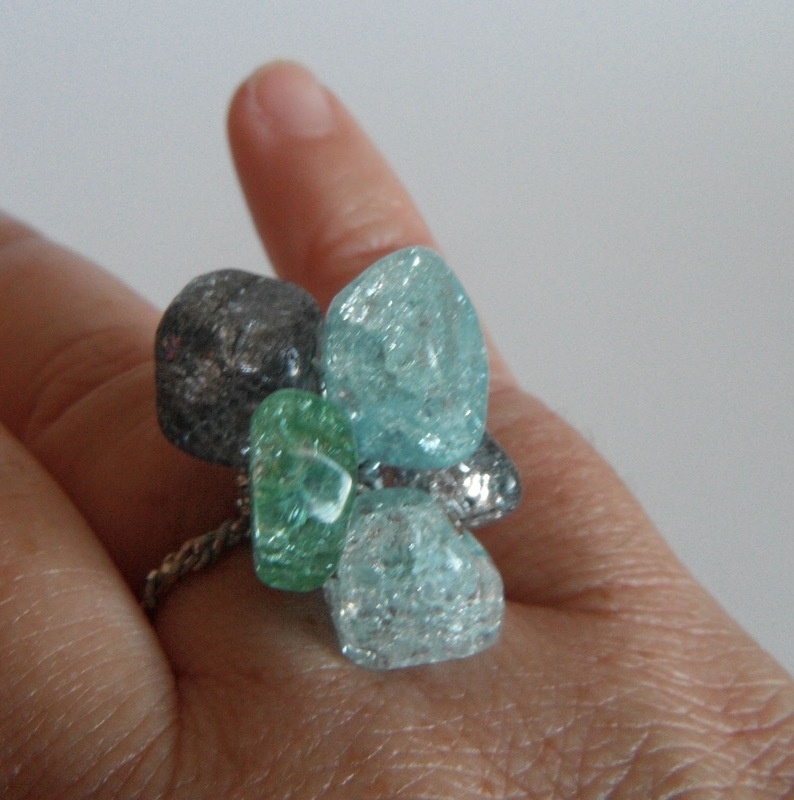 Sea glass would be awesome for this ring!). I liked that they weren't perfectly round, or perfectly perfect. I think it made the ring look more modern. You can make your ring to whatever design aesthetic your heart desires, though. R2:Using the magic loop tail AND the working thread, chain 20 (add more stitches for a larger ring, leave some off for a smaller ring). Sl st to the 3rd sc of R1 (or whatever stitch is on the opposite side of R1 from the chain). Fasten off. Weave in ends (which there isn't much space to do, I just tied it in a surgeons knot and used my crochet hook to weave it between the beads a little.) Snip off any extra elastic. Admire your awesome new ring! If you're going to make a bunch of rings, I highly recommend loading all of the beads on the elastic at once. I cannot emphasize enough that loading the beads is the hardest part, so if you get that done right at the start, the rest of the project will be fun. Maximizing fun is what we're all about here at Crochet Dynamite, so heed my cautions!!! Oh, and in case you missed it, Crochet Dynamite is now rockin' Facebook. Check it out! Aaaaand, you can feel free to check out my newly re-designed (and much easier to navigate) Free Patterns section. I spent an hour and a half re-typing and linking everything, so please go admire my hard work. Holy awesome bling rings, Batman! Huge, honkin' obnoxiously blingy rings are all the rage at my office but I've always been too cheap to buy any. (Even the super el-cheapo ones. I am el-cheapo squared.) I've got a bejillion little artifacts that would make great rings but never got around to figuring out how to make the ring part of something that wouldn't be uber uncomfortable. You have solved my problem!!! I super-duper can't wait to get the thread and start blinging! (And thank you for mentioning the bead reamer, something I didn't even know existed. So much learning at C. Dynamite!) Woo-hoo!!!!! And what an adorable story about your mom and dad. Sweetness. Your boundless creativity never ceases to delight and amaze me. Awesome story and awesome post! Your endless patience with me never ceases to delight me! You are awesome too! And now the whole world knows about it! Thanks for letting me share the story. Love you! CUTEST STORY! And I am loving the rings with the stones...Reminds me of when Superman is on Krypton with big ice crystal things jutting out everywhere! So so cute. You are so incredibly creative and talented! Thank you so much, Nancy! You just made my day! They were so much fun to make! And fast! Good luck! You rings are FAB!!! I looked at the original pattern and have to tell you, I have the original pattern pamphlet. I used to make those rings YEARS ago. We used to call them "Fun and Kicky". I will be going to the craft store today for elastic thread. I have some aurora borealis glass beads from the 60s that will make "kicky" and way sparkly rings. Thanks for bringing back a fun pattern. Keep up the good work! Thank you so much, Munkeh! I think "fun and Kicky" is the perfect description for how I feel when I wear mine. LOL!!! Hi Edna! You've got some really fun stuff in your etsy shop! I especially love the pop-tab bag! So cool! I love your Christmas present idea! I want to do that for Mims! Hi! 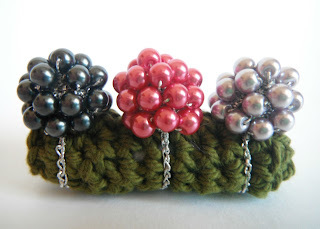 I've made lots of crocheted bead things years ago, and the easy way to get the small beads to the thread was to put some nailpolish on the thread. A couple of coats and it's stiff as a needle but still almost as thin as originally. Sure there are tools for the beads, but this worked just fine. Haven't tried with elastic, though, would love to make some of these but I have no idea where to find so pretty elastic, haven't seen any yet. Hi Heidi! That's a really great tip! I'm going to have to try it with the elastic. I picked up my elastic at Michaels, and I got some fun multi-colored elastic in a pack at Joanns recently. It was in the jewelry making section. OMG, my kids had these when they were small (mid-90s). A friend's mother used to make them. Thanks for directions! Marilyn in Maine! Hi Marilyn in Maine! Oh that's too awesome! I'm glad I wasn't the only kid that got to play dress up with these rings! 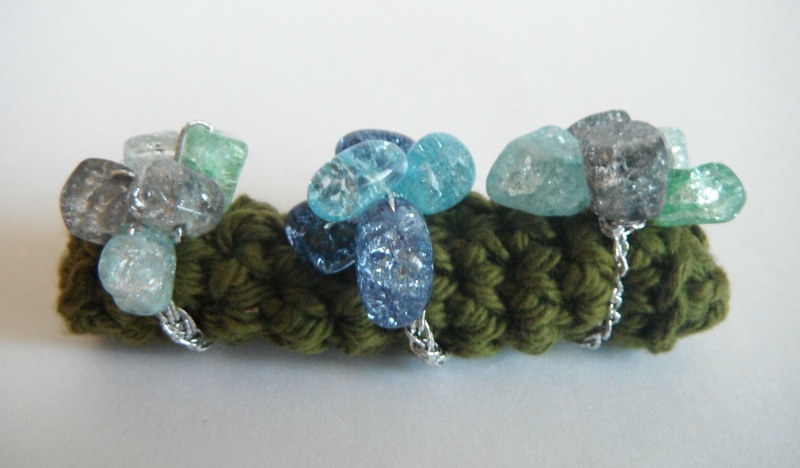 I use a dental floss threader to put the beads in the thread. Works great!!!! You're a GENIUS Ilene! I'm gonna try it! 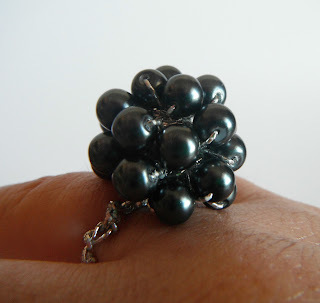 I was just thinking of a ring my mother had (like your mom's jet one except it was in white pearls with silver elastic). I loved that ring when I was a kid and I started surfing google today to find a pattern. Found you! Thank you for this! I'm going to try it and hopefully make some for me, my sisters, and my mom. They'll be so surprised!